•	reserve and sell tickets, including multiple shows and venues. •	produce reports incorporating all facets of your ticketing operation. Reports can be customized for your theater at no additional charge. •	access your customer history and manage groups from the Contact Manager. •	print contact letters, group contracts and labels and send email confirmations. 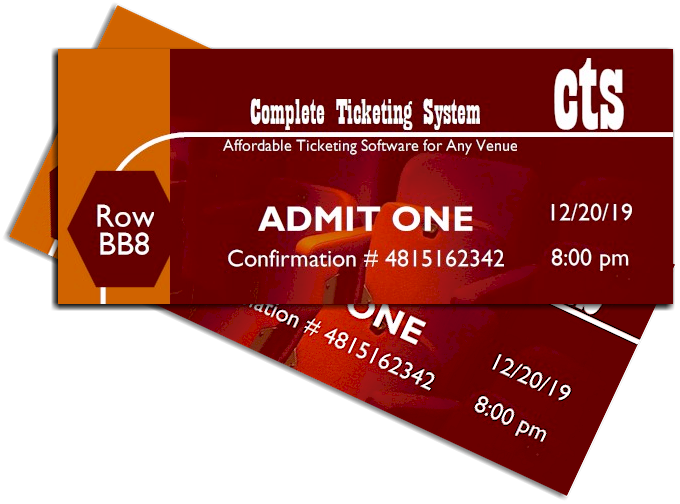 •	incorporate “FIT” pricing and billing on screen within the ticketing system. •	view reservations created, by our online ticketing system that sells for you. •	export your data to Word®, Excel®, or Quickbooks®. •	use a single Internet connection to clear all of your credit cards. • allow for automatic payments for Agent Pickup and FIT Billing. •	customize your employees access to different modules within the system. •	see your seating chart on the screen the same way it looks in the theater. •	have accounting, marketing, ticketing, and management all using the same data for reporting and cross-referencing information. •	keep your data on your own network. No more connecting remotely to your data in someone else’s data warehouse. •	receive tech support from the software programmer, available 24/7. Telephone, online, and on-site assistance is available as needed. •	have continuous online backup for your ticketing data, at no extra charge. Now available for server computers! © 2018 The Complete Ticketing System. All Rights Reserved.